Lovely Mens Vintage 10ct Gold, Ruby & Enamel Masonic Ring, Helm & Hahn. 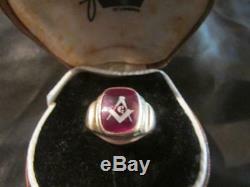 Here is a really lovely mens vintage 10ct gold, ruby & enamel masonic ring. The ring has a good strong wide 10ct yellow gold band around to a setting measuring approx half inch square with nicely stepped shoulders, so the rings setting sits proud of the ring. This ring is a lovely masonic ring which nicely is inset with a pink/red ruby stone which is polished & then inset with the masonic emblem & a G to the centre. The ring has a american hallmarks of 10ct gold & makers mark is rubbed but it looks to be HH, for Helm & Hahn & ring size Q & this ring is vintage just has wear as you would expect with age & wear & just needs a good clean & polish, see pics & a good weight of 5.5g. This really is a lovely Vintage mens 10ct gold masonic ring in very good origional complete condition & all ready to wear & a really nice unusual example of these. I love antique jewellery, so hope that you to can appreciate my items, that have been pre loved with history. But remember all my items are antique, vintage and pre owned, which is totally different to new. Please look at photos, pics carefully, sizes, and read the whole listing. Remember this is all my opinion, which may be different to your own. Get Supersized Images & Free Image Hosting. Create your brand with Auctiva's. Attention Sellers - Get Templates Image Hosting, Scheduling at Auctiva. The item "Lovely Mens Vintage 10ct Gold, Ruby & Enamel Masonic Ring, Helm & Hahn" is in sale since Tuesday, June 12, 2018. This item is in the category "Jewellery & Watches\Men's Jewellery\Rings". The seller is "dragonheartantiquejewellery" and is located in South West. This item can be shipped worldwide.